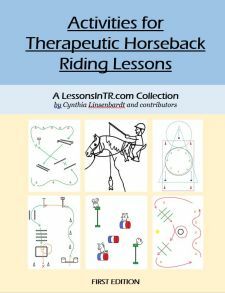 When I first started teaching, I spent a lot of time making new lesson plans every week for my riders. Now that it’s been a few years, I still take time to lesson plan every week but it goes faster because the lesson plans stay very similar. This got me thinking about the importance of consistency in lesson plans – and when to change it up. Here are some thoughts on that. Consistent lesson plans (the way I am using it) means keeping the exact same lesson plan every week for a rider, but making little changes and tweaks. It keeps the lesson predictable for the rider. When other things in the rider’s lessons are changing (such as a new instructor, new volunteers, new horse, etc. ), at least the lesson plan stays pretty much the same, so this predictability and familiarity are comforting to the rider in the midst of all the other changes. I have been doing this the last few weeks with my new riders, who are all disinclined to change, and it has really helped. It also makes me think of toddlers, for whom routines are so important because they are so small in such a huge unpredictable world that it makes them feel smart and safe when they know what comes next. It allows incremental changes in order to progress. You can make small tweaks and additions to the warmups, way you teach the skill, and the practice and activity, in order to slowly progress the rider over several weeks. For example, you start them off warming up with arm circles one at a time, then a few weeks in have them do arm circles both at the same time. The past few weeks I’ve used the same zigzag cone pattern for my riders every week, progressing in difficulty – we start with the familiar zigzag, then add a harder or new type of turn, and last week I even added poles next to each cone to encourage returning to the same starting point and getting some added motion from their horse. It allows repetition over weeks to habituate new skills. For some riders it is more helpful to practice a new skill the exact same way over several weeks, than to constantly switch it up. If they did not “get it” the first time, they may need more practice doing the same thing! When we learn something new, we are constantly playing around with it, getting closer and closer to the right way, until we do the it right way enough times it becomes habit, automatic (think staying up in two point, or posting!). If you are constantly changing the environment in which the rider practices the skill, it may actually make it harder for them to learn it, because not only are they working on the skill, but they are processing the new environment and dealing with the changes. (Note this is only for some riders, there are other riders for whom a change may be good – see below). I think this is especially important for really hard skills. It fosters independence in riders and memory skills. When you do the same thing every week, eventually riders can do more and more of it themselves – such as walk their horse a few laps before mounting, or remember their usual warmups (perhaps plus one progression given by you). This works on independence, memory, and self confidence! It helps instructors refine their teaching skills. You can make incremental changes in yourself week to week to improve the lesson. If you’ve never done the same lesson plan weeks in a row, you can learn a lot about yourself and your students! In particular for Instructors In Training, practicing relatively the same lesson plan over and over again is helpful in that it soon becomes so familiar that they stop focusing so much on the lesson plan and can focus on their teaching techniques and really responding to their riders. It’s also a good practice for ITs who focus too much on games and having something super exciting for their students every week – it helps them see the benefits listed above for themselves, and that it’s not the end of the world to not have a new activity! It can decrease stress in the horses. Horses are also creatures of habits and routines, so when lessons are consistent and they know what’s coming, they may be less stressed. (However, for many horses it’s the opposite – the consistency creates boredom and poor behavior – see below). Consistency in lesson plans also helps horse handlers be more consistent in how they handle the horses, which can decrease stress. Changing lesson plans (the way I am using it) means changing up the lesson plan every week – perhaps new warmups, new skill, new activity, or any combination thereof. It helps when something is not working. If the rider did not “get it” the first time or first few times, they may need a change in activity or in how you teach it. You may need to change it up every week until it “clicks”! While some riders need consistency, other riders may get stuck in a rut and need to mix it up to progress – or they may need to completely stop working on a certain skill for a while and try something completely different. It helps to keep their attention. For some riders, doing relatively the exact same thing every week can be boooooring. It’s a thin and creative line you will have to walk to switch it up enough to keep their attention, but keep it consistent enough that their body can habituate to the skills, as well as sneaking in keeping their attention for longer and longer amounts of time. It helps keep them at their best. For some riders, doing the same thing weekly means they start to slack off and not do those things as well. Switching it up keeps them on their toes and trying hard, instead of getting lazy. It makes a statement. Such as “we’re working on a new skill” or “I’m your new teacher” or “it’s time to pay attention.” Use changes to your benefit! 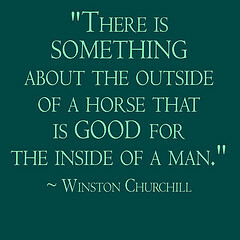 It can decrease stress in horses. Some horses get bored in lessons quickly, and behavior issues quickly follow. Switching things up can keep their attention and keep them happy. As you can see, I trend toward more consistent lessons than changing it up an awful lot. I definitely keep the mount, warmups and skill review pretty much the same, then switch up the activity as needed. I change most of the lesson plan when I teach a new skill, but keep some things consistent depending on what the rider needs. When I taught high school I kept a consistent structure for predictability but changed the content and the activities to keep things interesting. I always did a warmup, lecture, activity, then closing. My students knew what to expect, which cut down on behavior issues, but I still had plenty of flexibility with the content, which kept things (hopefully!) fresh. As with most things, it’s a balance, though like you, I tended toward consistency and routine. I would rather have a student fall asleep than act out. I’m primarily a dog (& human) trainer but this is a fabulous post by any standard. This balance of new and old is absolutely what I aspire to in my own classes, and it is expressed so beautifully that I’m going to save and share and review it with our trainers as well as some others who will appreciate it. We have 12 trainers + apprentices who do group classes. Your points under Pros and Cons can each individually be pulled out and discussed as important concepts for “trainer training”.